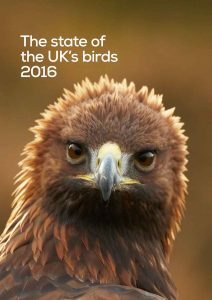 State of the UK’s Birds (SUKB) 2016, released today, highlights that more than one quarter of the UK’s birds are in need of urgent conservation effort, whilst for other species there is some good news. Many of the UK’s regularly occurring birds species have suffered declines in numbers and/or range in the UK which have resulted in them being ‘Red-listed’ under Birds of Conservation Concern making them of higher conservation concern. Among them is the Curlew, Europe’s largest and most distinctive wader. The UK supports up to a quarter of the global breeding population of Curlew and could be considered one of the most important countries in the world for the species; however, numbers have almost halved in recent decades due to habitat loss. With the species now considered globally Near Threatened, an International Single Species Action Plan under AEWA has been created and concerted efforts are underway to understand the drivers of decline across the UK. SUKB 2016 also highlights good news for some species, with recent surveys of Golden Eagles and Cirl Buntings indicting that numbers of breeding pairs have increased in the UK. There has also been success for Bittern and Nightjar, whose conservation status has improved thanks to the creation and management of suitable habitat. Among other news in the report is the status of the UK’s wintering waterbirds, which overall have started to decrease following a period of stability; however, there are mixed fortunes among the individual species. In the long-term, the majority of goose populations are faring well, particularly British Greylag Goose and Greenland and Svalbard Barnacle Goose, whilst a number of duck species are showing signs of decline, notably Pochard (which is now classed as Vulnerable on the IUCN Red List of Threatened Species), Scaup and Goldeneye. For further news see the full report here.